In my previous two posts, I illustrated how your team can Use cron and curl to Regularly Download API Performance Data and How to Use Python to Extract API Performance Data. 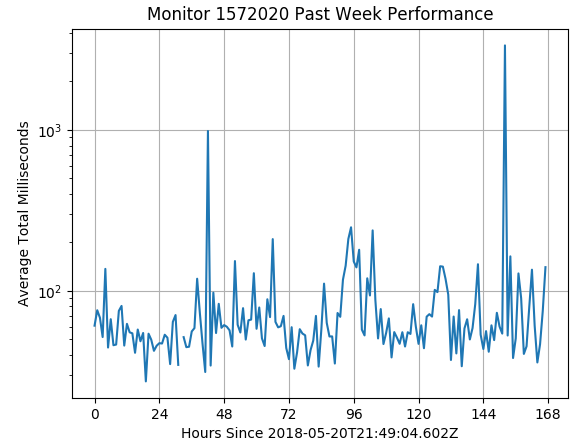 In this post, I illustrate how you can use the Python MatPlotLib library to create plots of the downloaded data that will be of value to your API performance monitoring team. In the first article, we utilized the API Science Performance Report API to download JSON data and store it in a file on our local disk. In the second article, we created a Python script that reads the JSON text file into a Python dictionary. Now, we can use MatPlotLib to create plots of the data in the Python dictionary. In this MatPlotLib example, we’ll plot the averageTotal data, that is the total number of milliseconds between the initiation of the request to the API and the completed download of the response. perf is the dictionary into which the JSON was read, as described in the last post. n_results is the number of results stated in the JSON download from the API Science API (a week of data averaged in one-hour time bins). In the first three posts of this series, we’ve downloaded a week of API performance data from the API Science API, read the JSON into a Python dictionary, and used MatPlotLib to create a plot of the total performance data — and accomplished all of this using a one-line csh script and 20 simple lines of Python code! In my next post, we’ll create a simple web site that publishes this information to your team as they need it, wherever they are located at the time.